That said, I had a lot of fun with the whole process last night. I've done fusing a few times, but didn't really have any specific projects in mind. I made a few headpins, made some rings - but really didn't take it much further. I did discover a few little tidbits that will help you out. 2) Make sure you have no visible seams. Silversmiths will know this already. You can't join air together. The metal being fused MUST be flush with the other bit of metal. If you can see a gap, it most likely wont work. Save yourself some effort, and use your pliers to make sure the seams are touching with no gaps. While we're waiting for the video, here's some pics of my workspace last night. 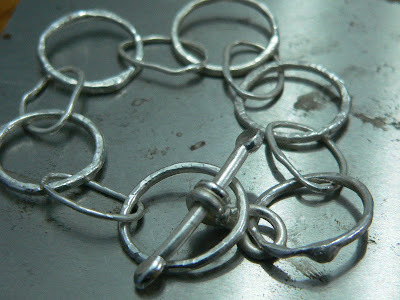 I was making a chain using handcut jump rings from fine silver wire. The gauge I was using was around 14. 12 gauge would work well for this too. 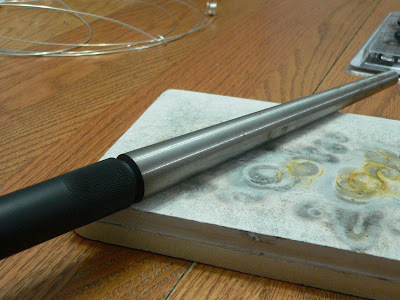 I made about 10 wraps of wire around a metal ring mandrel, and then cut the individual rings with a flush cutter. A double flush cutter would have worked better. Ohhh - Tip 4 - Use the best tools you can afford. I once had a set of very good tools, that unfortunately my husband got a hold of - they're now rusted pieces of junk. Excellent quality pliers and cutters will set you back in the range of $30 to $85.00 per tool. Double flush cutters are definitely on my wish list. You can fuse up all of the larger rings, then connect the larger rings with the smaller jump rings to form a chain. Then fuse all of the smaller links. These jump rings have seems - bad, bad seems! The blog post for today will be delayed until much later this evening. I got a little ambitious and created a fusing video for you! Of course, I'm having technical difficulties that need the attention of my techie husband - and he can't help until tonight. More later! 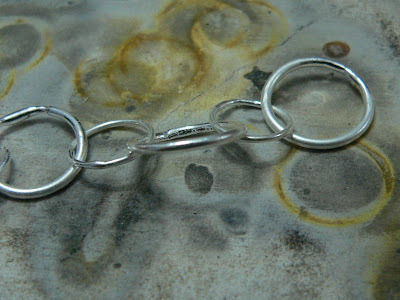 Over the next couple of days I'm going to be blogging about fine silver fusing. 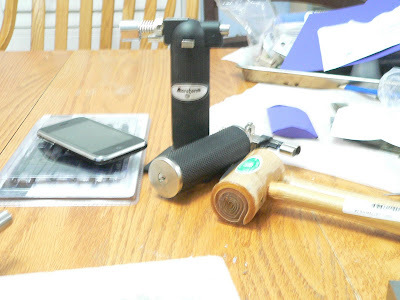 You can easily, with minimal equipment learn how to create your own headpins, rings, connectors, and all sorts of other components you dream up to jazz up your beaded jewelry. You don't need pickle, solder, and all of those other nasty chemicals. 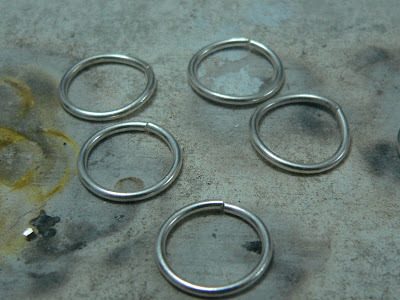 I've got a photo tutorial coming tomorrow on how to create fancy textured jump rings, and Friday we'll show you how to make a variety of other components. More tomorrow, but in the meantime here's a link from beading daily on how to make headpins. This may be a quiet week, but the upcoming months are not. I just posted a bunch of bead stitching classes with Cindy Vroom. Cindy has been avidly beading for somewhere around 10 years now. Beads and beading are a fascination and a compulsion for her as both her impressive bead stash and portfolio of finished works can attest. She is happiest when her hands are busy and can think of no better activity than beading to fulfill this need. She also plays with clay between beading and making her living as a set painter/house painter. Beginning Thursday September 10th, Cindy will be offering a 4 week course, Basic Bead Stitching 101 Continued. This is a continuation of the Basic Bead Stitching courses offered earlier this year. Students can register for these classes one at a time (class fee is $30.00/per class) or take all 4 for the discounted price of $100.00. If you would rather take the original Basic Bead Stitching course it is available beginning Thursday November 19th. This class also runs for 4 weeks and the same discount is available. Looking for something a little sooner? Well, August looks great. We end of July with Catherine Winter's How To Have a Successful Craft Show, from 6-9:15pm. What a better way to begin a new month than with a Metal Clay Play Day on Tuesday August 4th, from 11-6. Please call and let us know that you are coming! Wednesday August 5th is Dwyn Tomlinson's Learn to Make Glass Bead-4 Hour Introduction to Lampworking from 4-8pm. Thursday August 6th, Wire Bead Crochet Basics with Stephanie Dixon from 6-9pm. And 1:30-4:30pm is the Double Spiral Bracelet. This is a beginner class so there is no prerequisite. 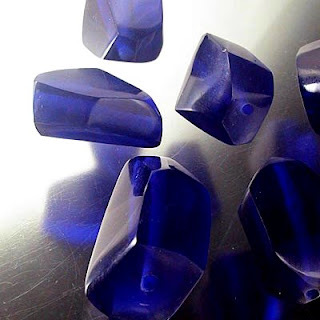 Amy Waldman-Smith is offering a Learn to Make Glass Beads weekend on August 8th and 9th. Sunday August 9th we have Stephanie Dixon's Wire Bead Crochet Earrings from 1-4pm. 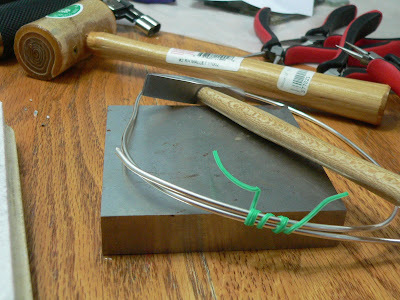 Monday August 10th Robert Burton's Wire Working 101 3 week class begins. There are only a few spaces left! August 11th is Charmed I'm Sure with Heather Bell-Dennison from 10:30-5:30pm. Don't forget that we have Happy Hour Torching on Thursday from 5-9pm, buy one hour get one free! You may have considered using a bead that you can see needs to hang vertically - but the hole seems to run in the other direction. What to do? 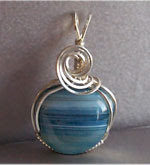 Here's how you can simply use a headpin and a few spacer beads to wire up a handsome pendant. You can even keep a selection of these handy and swap them on and off a single chain. You will need a headpin, some spacer beads, and, of course, your bead to hang vertically. Last week, we discussed using spacer beads to ensure that the headpin doesn't pull through the hole of the bead. Try different combinations of headpins and spacers until you get a look that you think is pleasing and attractive. The bigger a bead is, generally, the larger the hole, and so, your headpin may "slop" around inside the hole, making it hang slightly off-centre when done. To stop this, find some inexpensive beads - seedbeads or small metal beads - that will fit inside the hole, and stop the focal bead from tilting to one side. They just need to fill up that extra space. At the other end of the bead - which will be the top, I like to select spacers/beads that complement the spacers/beads at the bottom, for a balanced look. Then make a Wrapped Loop. We have a video tutorial here, but here's a quick recap as well. Bend an angle (about 90 degrees) in the headpin. Leave a small gap before starting the bend. Bend the headpin around the roundnose pliers to start the shape of the loop. 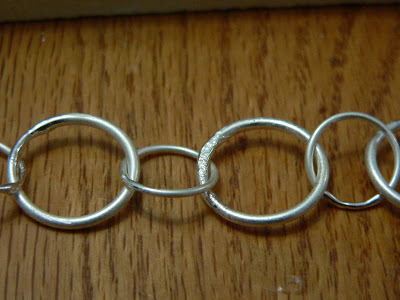 Reposition the pliers inside the loop and continue to make a round loop. 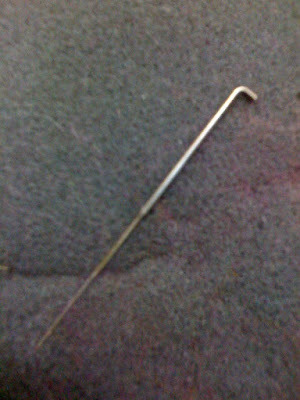 Finish by wrapping the tail of the wire around the headpin in the small gap you left earlier. Sometimes the loop that you make is still not large enough to fit easily on and off the chain that you have chosen to hang the bead from, but you can easily add a larger jumpring to the loop to make it fit the chain you have in mind. Actually - I'm not really happy with that wrap - I made the loop a little too large and consequently, ran out of headpin to make the wrap really tight, but you get the idea! Wednesday was rather a special and interesting day - for reasons that I won't go into, but it seems somehow portentous and appropriate that there was an amazing display of Aurora Borealis that night. Of course, you couldn't see it HERE because of the clouds and rain, and so, while we were stuck in rush hour volumes of traffic in the driving rain - at midnight - (OK - it was midnight on a Wed - where were all these cars going to? Or coming from? Midnight. Wednesday. Crush hour volumes. Hello, Toronto - you need to fix some roads - the cars are not going away!) Anyhoo - if you are interested in Auroras and space stuff, you need to know about spaceweather.com, and if you want to check out some pics of the Aurora and other cool (even tho' it's non-beady) pics - check out this Canadian photographer. Coming at ya - sterling clasps and boro beads! 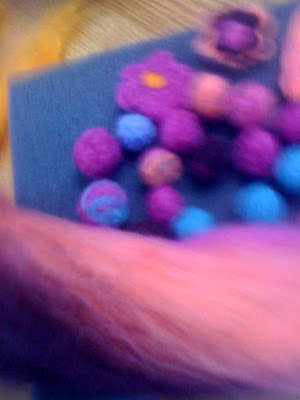 I just across this awesome felting tutorial on flickr. It's a photo tutorial only, but it shows the process. Ohhh...her beads are gorgeously simple. Very well done! 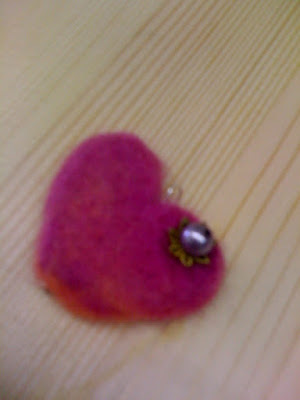 I did manage to make a lovely pair of earrings, and a not so lovely heart pendant with my felted beads. The heart has potential with the right embellishments. I really need to stop attempting to work on things at 2 am ;-) I have a bracelet started as well, but that will have to be for another day. Stacy made a comment this morning on yesterday's post regarding wetting them. That's actually what I did last night. They felt a little too squishy, so I finished the process with wet felting. 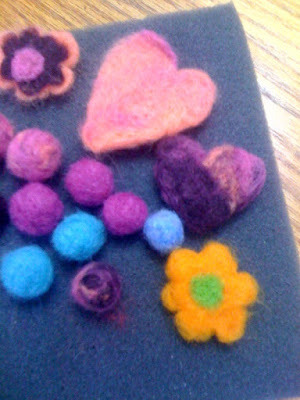 More on wet felting below. 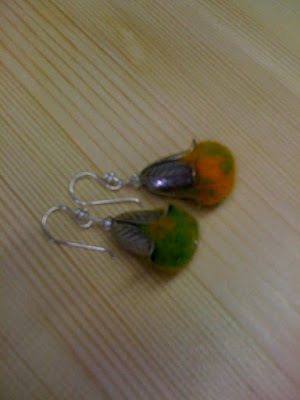 I've also found a lovely selection of really nice felted jewelry by artists - check em out! Yesterday I was stuck at home with a bit of a stomach bug. I start to go a bit stir crazy though, and then I remembered that a while back I had bought some lovely hand dyed roving. 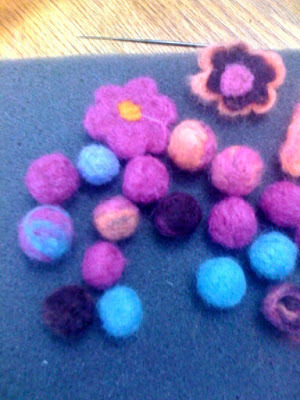 I pulled out my felting needle, a sponge, the roving - I now have a bowl full of lovely beads. I discovered that blue faced leicester is the easiest (out of what I had) to needle felt, but the merino wool roving had the loveliest feel. The general idea for needle felting round beads is that you take a small amount of roving, and roll it into a nice tight ball. * Roll this ball in the palm of your hand for 30 seconds or so to help shape it up. * Lightly place your new ball on the sponge, and start poking it with your felting needle. Keep turning the ball around, and poke from different angles and sides to keep the ball round. * Be careful! - that needle is really, really sharp. * Keep poking (a couple minutes) until your bead is nice and tight. 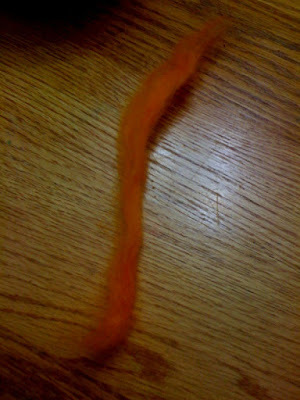 If you made it a solid colour, you can take itty bitty bits of roving to add dots, or stripes on your new bead. Here are some pics of the process - Also stay tuned tomorrow for what to do with your new bowl of beads! 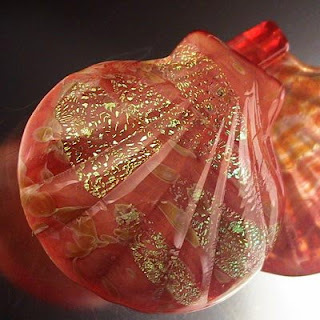 Every week I blog to let you all know what is happening at Beadfx--mostly about classes and sometimes about other special events. I was thinking this morning that it would nice to know if the classes we are booking are what everyone is looking for. Are they? Let us know please. I am actively working on the fall schedule and have some really exciting new stuff coming. Heather Bell-Denison has some great new ideas that should be coming to the site in a few weeks. Stephanie Dixon has some new stuff in the works too. We have Michael David Sturlin coming this October, those classes should be really great. But I would really like to know what else you are looking for. Do you want project based classes? Or are you more interested in technique based classes? The aim with classes, is of course, to help out our customers and this is why I want to know what you like. If you are a new beader and looking for beginner classes let me know what type you are looking for--stringing, stitching, wire work... If you are a seasoned beader and would like to try something more advanced or directed at a specific skill I would love to know that too. Comment on the blog or send us an email, let us know what you are thinking. We have a lot of really fun stuff coming up in the next few weeks. This week we have Pam Kearn's first class here at Beadfx. Pam is a beadstitcher with a focus on peyote, spiral rope and crochet. She has been beading for about six years and sells her jewelry and gift items through art and craft shows in the Southwestern Ontario area. Pam has another class focused on how to read patterns coming later this summer. Join Pam on Thursday July 23rd for Spirals of Delight from 6:30-9pm. 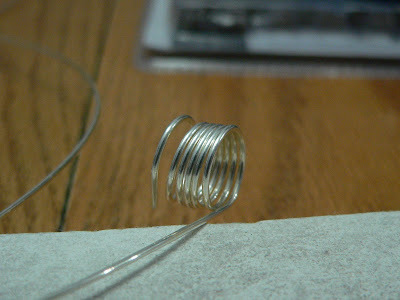 And Simple Wire Wrapping Techniques from 2-5pm. 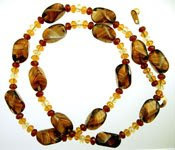 Stephanie Dixon's Wire Bead Crochet Multistrand Necklace is on Sunday July 26th from 1-4pm. Thursday July 30th Catherine Winter is offering her How to Have a Successful Craft Show workshop from 6-9:15pm. A Metal Clay Play Day has been scheduled for Tuesday August 4th from 11-6pm. Please call the store and let us know that you coming. Don't forget that we have Happy Hour Torching from 5pm to 9pm on Thursday. Buy one hour get one free! Call the store to reserve your torch. You're wiring up a pendant, and the only headpins you have have too small a head for the hole - they just slide right through the bead! Use a spacer bead with a smaller hole to stop the headpin going through the hole in the bead! Add one more more spacer beads - I find you can create a very nice look by stacking them - and you can handily stop the headpin from pulling through the hole. I have a little bin that I put all the little left over spacers from projects into - so that I always have an interesting assortment of beads handy for just such use. It was a dark and stormy night, when suddenly, a shot rang out ... Or - you can just go read the winners of the contest that immortalizes really bad opening paragraphs. ;-) Check out the winner of the Vile Puns category. Grooooooan. 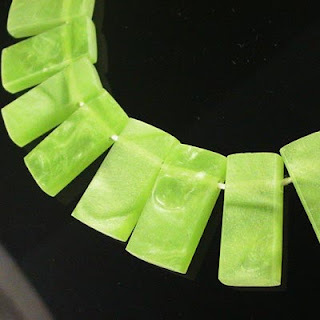 Resin beads - lightweight, warm to the touch, fun and fabulous. Perfect for summer! Yes! I'm busy preparing for Isla's 4th birthday party tomorrow. She has requested a 'butterfly' party. Marg picked me up some fabulous paper butterflies from one of our suppliers. We're going to decorate the back yard with them along with flower garland that Maya has been making. Over the summer, I haven't been able to get out and do the weeding as much as I should have. It's become a huge problem, but we're out there tackling it now. We just discovered that one of my rose bushes has become so incredibly huge and heavy. It broke the wood trellis, and has collapsed onto the walkway to the backyard. Since our guests will be coming into the party that way we need to get that fixed. We pretty much need full body armor to deal with this though! Signing up for classes - or we really do answer the phone, honest! Unfortunately, at this time we do not have a way to offer class sign-ups through our website - so you need to actually call us! Alternately, if you can't call during those hours, you can leave a message - the general mail is fine. See - we're pretty much all night owls here - and we don't have anyone answering the phones before 11 am on week days. Or email us your phone number and we'll call you back. Be sure to check out the contests page on beading daily as well for your chance to see your projects in print! Sorry I am posting a bit late today, I am home with the kiddies this week so I am at the mercy of the nap schedule. That being said we do have some exciting news...we have booked two classes this fall with Michael David Sturlin! Michael David Sturlin's 40 year career as a studio jewelry artist, educator, industry consultant and award winning goldsmith includes recognition from the World Gold Council, the American Jewelry Design Council, and the Jewelers of America's JA NY New Designer Gallery. Michael's internationally acclaimed jewelry focusing on minimalism in precious metal has been published in 75 magazine articles and is featured in the books MASTERS:GOLD and Crocheted Wire Jewelry. Faculty member of the Revere Academy of Jewelry Arts, and a popular visiting guest, artist and conference presenter, Michael devotes his time to sharing his expertise and insight with students at every level from beginners to accomplished professionals. October 22nd and 23rd Michael is offering his signature Hand Crochet Chain. This workshop is open to students of all levels. October 24th and 25th is Michael's Quick Clasps and Findings Workshop. This is a beginner plus/intermediate level class. Students should have some understanding of basic metal smithing. Please note that the kit fee is still to be determined, those fees should be determined over the next couple of weeks. Looking for something a bit sooner? No problem we have tons of classes coming up this week. Thursday July 16th Catherine Winter's How to Price Your Jewelry-Starting a Microbusiness runs from 6-9:15pm. Stephanie Dixon's new class Turquoise Lustre Blooms is on Saturday July 18th from 2-5pm. Wednesday July 22nd is a 4 hour Introduction to Lampworking with Dwyn Tomlinson from 4-8pm. Thursday July 23rd is Pam Kearn's Spirals of Delight from 6:30 to 9:00pm. This is a great class for beaders of all levels. You will learn peyote but also how to incorporate focal beads into your pieces. Sunday July 26th is Stephanie Dixon's Wire Bead Crochet Multistrand Necklace from 1-4pm. Don't forget about Happy Hour Torching this Thursday from 5-9pm, buy one hour get one free! Dwyn will be in around 7ish, don't forget to book your torch in advance. Honey - where's the duct tape?